Kino Flo’s new Tegra 4Bank redefines the evolution of light by combining the Academy-award winning features of the 4ft 4Bank portable system with onboard control features of the Diva-Lite 401. No other light features onboard dimming, onboard switching, remote hand-held dimming, and Universal input voltage (100VAC to 240VAC). Proprietary solid state electronics operate the lamps on high output, flicker-free, and dead quiet. 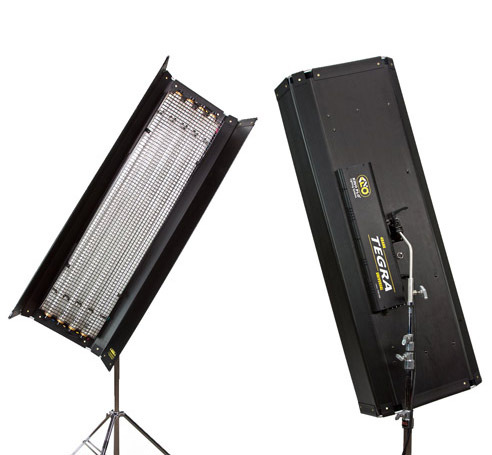 The fixture produces as much light as a 1,000W tungsten softlight, using only one third the amount of power. The built-in barndoors with newly designed hinges, honeycomb louver and center mount system make the lightweight Tegra ideal for hand-held shots, rigging in tight locations or mounting on a light stand. Available Light includes a DIM-5 Remote Dimmer with the Tegra 4Bank system. We also offer 29K, 32K, 55K, Cool White, Warm White, Green screen or Blue screen bulbs with the Tegra system.